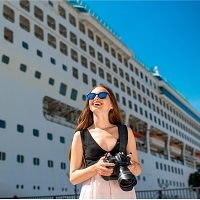 If you often dream of a cruise vacation with your closed ones but cannot plan due to heavy expenditure or unreliability of cruise ship, then you should avail our services now. At Adventurous Andaman, we are instrumental in rendering reliable cruise services to the voyagers across Port Blair (Andaman Nicobar Islands, India). Our cruise agents are associated with some of the reputed cruise ship providers. We ensure that the cruise ship is equipped with the most modern amenities. So, contact us anytime.